Tang Yuan (汤圆) are a traditional sign of Chinese New Year, made with sweet and savory fillings. 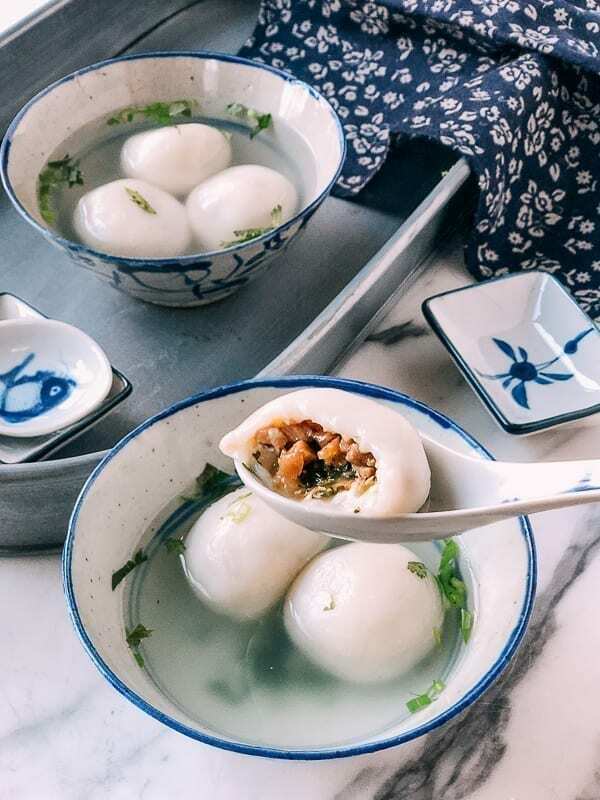 You’re probably most familiar with the sweet version of these round glutinous rice dumplings (the direct translation is “soup ball”), usually filled with sweet sesame paste, red bean paste, or sweet peanut paste, served in hot water or a light sweet soup. Judy’s recipe for Black Sesame Tang Yuan is traditional, easy to make, and has been tried and tested many times! But the much lesser known variety is a Savory Tang Yuan made with pork filling. 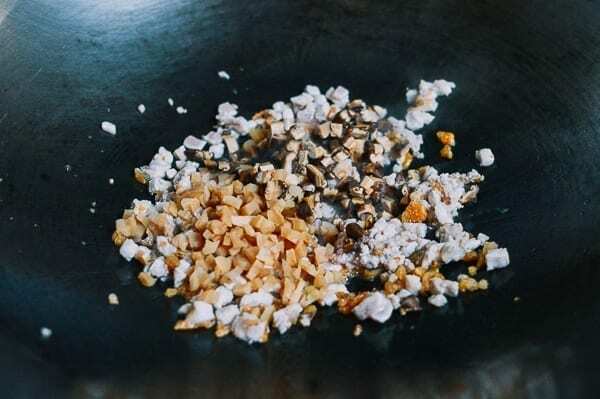 The filling is inspired by Hakka flavors and uses a winning combination of salted radish with pork, dried shrimp and mushrooms. Tang Yuan are sometimes called yuan xiao when eaten during the Lantern Festival, also known as the Yuan Xiao Festival or yuan xiao jie (元宵节). 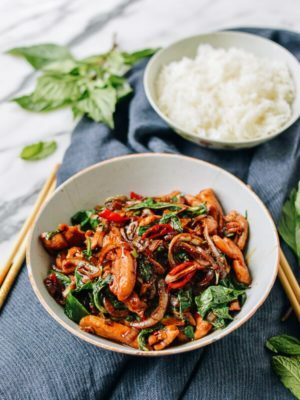 Chinese New Year’s eve and day are always celebrated with family gatherings and dinners, but the following days are also part of the festivities. The Lantern Festival is always on the 15th day of the first month of the lunar new year. It marks the first full moon and signifies the official close of Chinese New Year celebrations. People celebrate this day by hanging all kinds of lanterns (like the ones we saw when we went to the Chengdu Temple Fair, watching lion dances, and, of course, eating lots of Tang Yuan, both sweet and savory. Celebrate your Lantern Festival holiday this year with some of these Savory Tang Yuan. 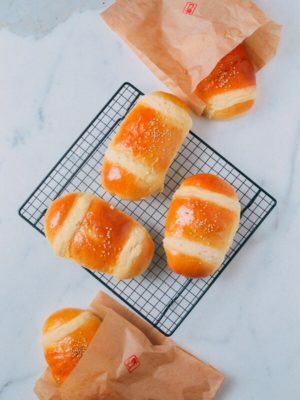 They’re surprisingly easy to make, and they also freeze well for preparing in advance. 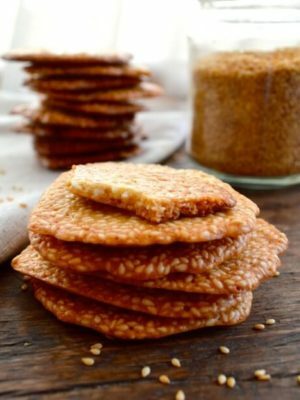 Get your friends and family to help you make a big batch! 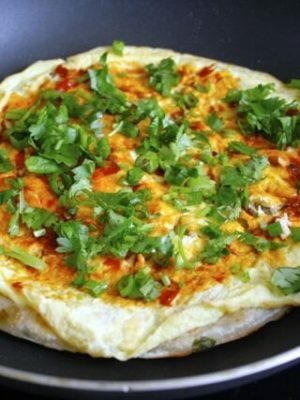 First make the filling. Soak your dried shiitake mushrooms in a bowl of hot water for 30 minutes. 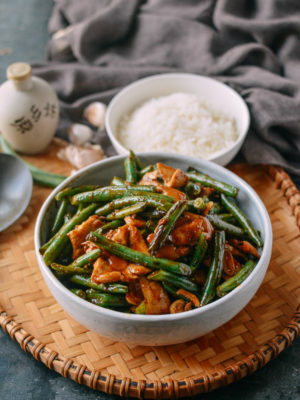 Place a small plate on top to ensure they’re fully submerged. Cut the stems off the mushrooms and discard them. Return the mushrooms to the water if they still seem dry inside, since thicker mushrooms will take longer to rehydrate. Finely chop the mushrooms and set aside, reserving the soaking water. Also soak your dried shrimp in hot water for 30 minutes. Strain and rinse them before chopping them. Rinse the salted preserved radish under running water and pat dry before chopping. Tip to save time: prep the other ingredients while the dried shrimp and mushrooms are soaking! 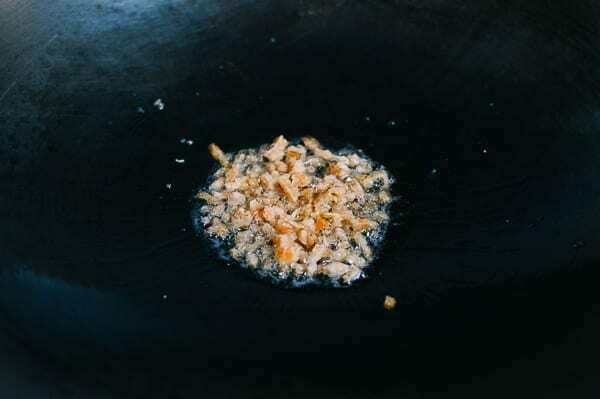 Heat 2 tablespoons vegetable oil in your wok over medium low heat. Add the dried shrimp and cook until fragrant (about a minute). 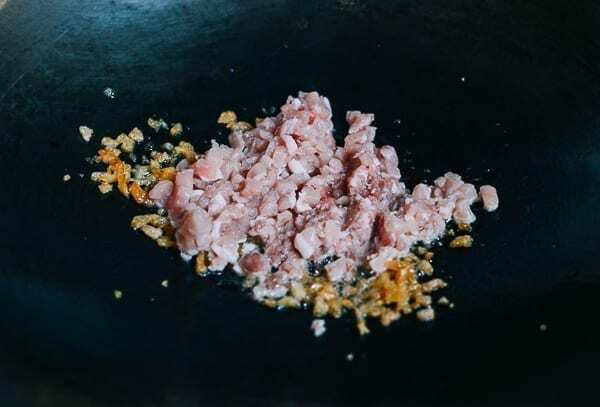 Next, add the ground pork and stir-fry for 30 seconds, or just until the pork is no longer pink. 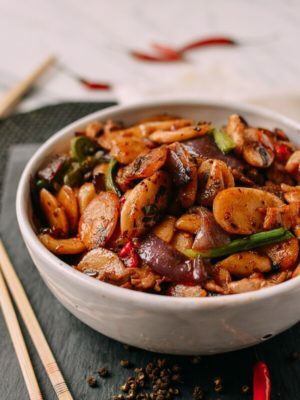 Add the chopped Shiitake mushrooms, salted preserved radish, and Shaoxing wine. Stir fry for another 30 seconds. 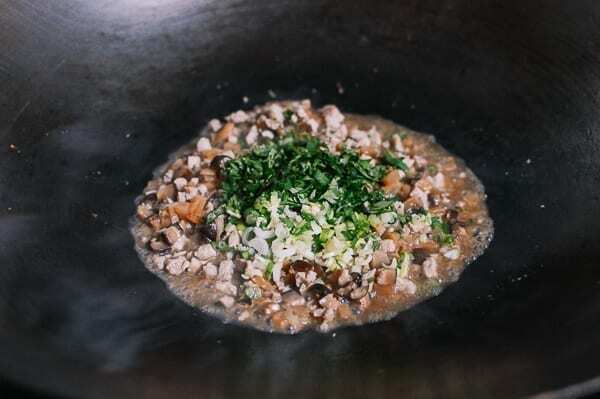 Mix in the sesame oil, salt, sugar, white pepper, oyster sauce, chopped cilantro, chopped scallion and 1 cup of the mushroom soaking liquid. 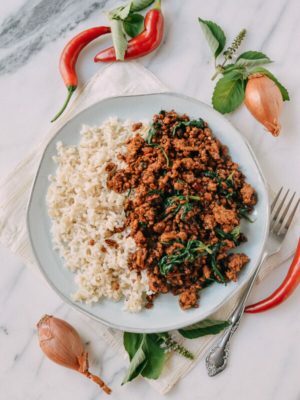 Cook on medium low heat until simmering, stirring often for 2 to 3 minutes, or until about half of the liquid has evaporated. Next, stir in the cornstarch slurry. Cook until the mixture thickens and all standing liquid cooks off. Set aside, cool, and refrigerate for 30 minutes to an hour. While the filling cools, make the dough. Mix 3½ cups glutinous rice flour and ½ teaspoon salt in a large bowl. 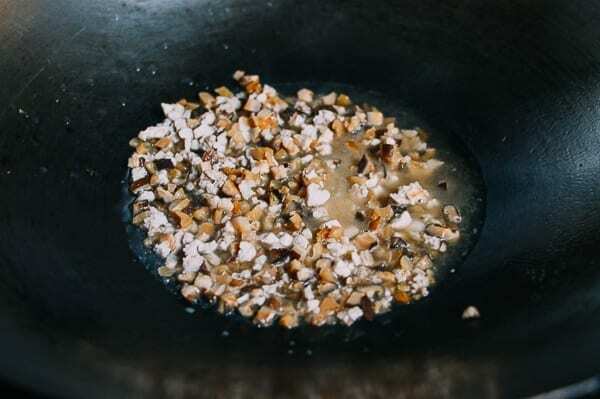 Stir in 1½ cups warm water and mix with chopsticks or a rubber spatula until a dough begins to form. Use your hands to knead until smooth. 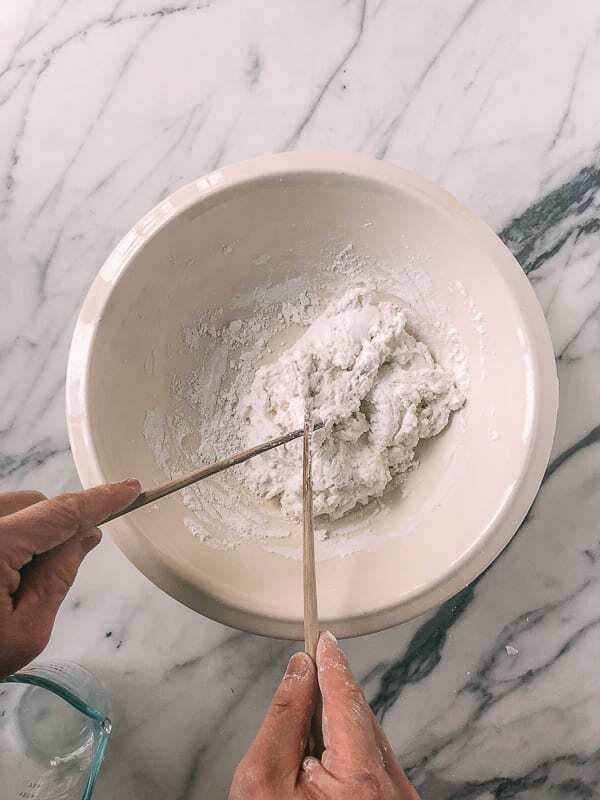 If the dough is too sticky, simply add more glutinous rice flour 1 tablespoon at a time until the dough forms a smooth ball. Next, pinch off three small pieces of dough to form three balls about 1 inch in diameter. Cook in a small pot of boiling water until they float, about 6 to 7 minutes. 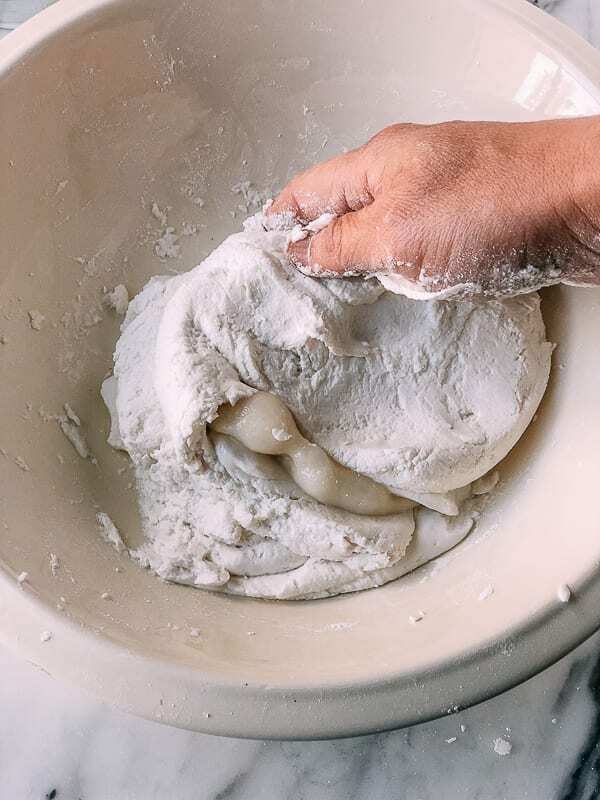 Now, add them to the raw dough, kneading them in until the dough is soft and smooth. I have to admit when I did this, I was slightly worried the dough wouldn’t come together, but give it a few minutes of kneading, and it does! 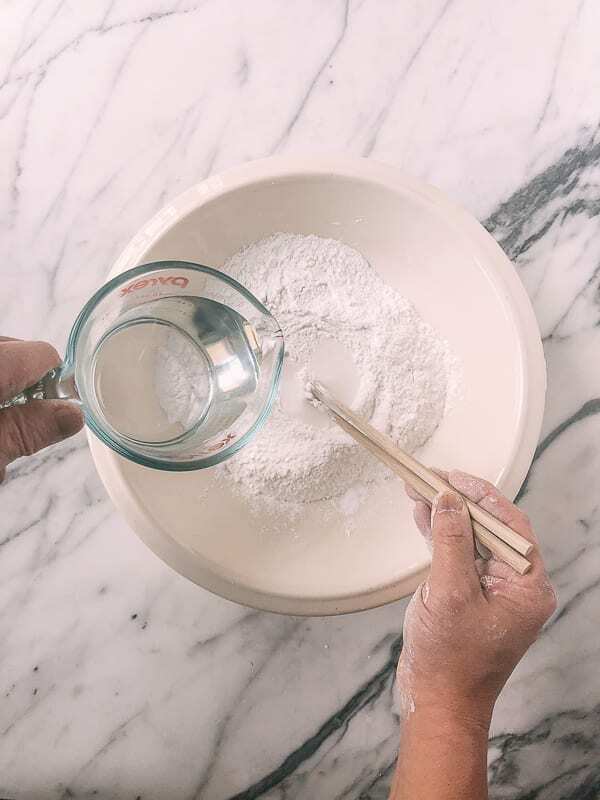 Now, divide the dough into 24 equal pieces about 32 grams each (a digital kitchen scale helps to ensure each is the same size), Keep them covered with a clean, damp kitchen towel to prevent drying while assembling your Savory Tang Yuan. 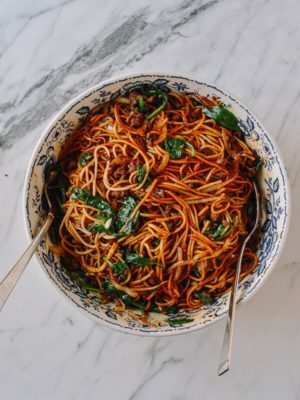 Take your filling out of the refrigerator, stirring it to redistribute the ingredients. 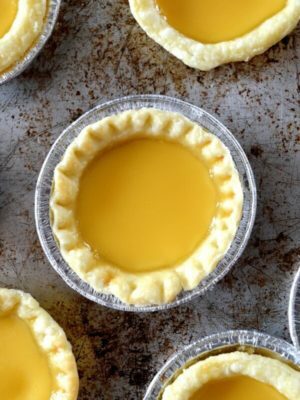 There should be no visible liquid, and the filling should be somewhat dry. 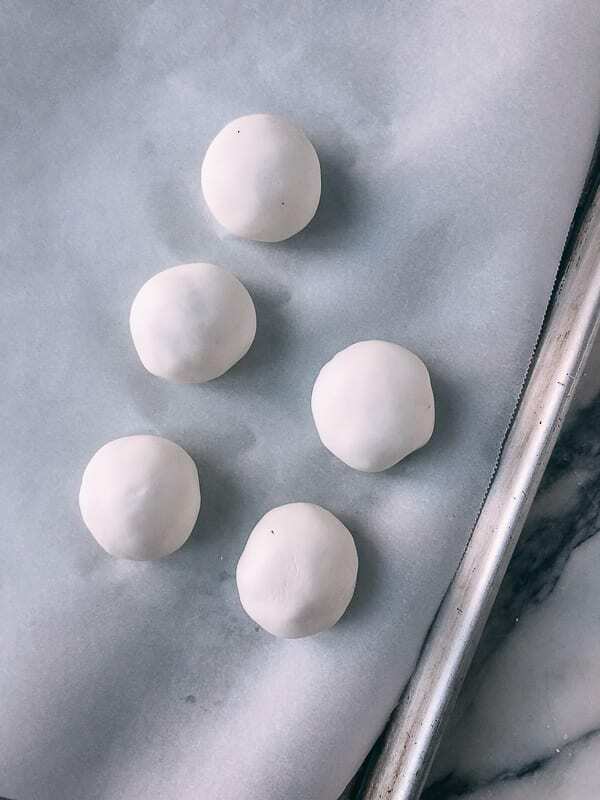 Use your fingers to form each dough ball into a round disc. Spoon about 1 tablespoon (15 g) of filling on the center of the disc. Use the spoon to lightly pack the filling so there are no air pockets. Fold over the edges of the dough to close the tang yuan, lightly pressing in the savory filling if needed. 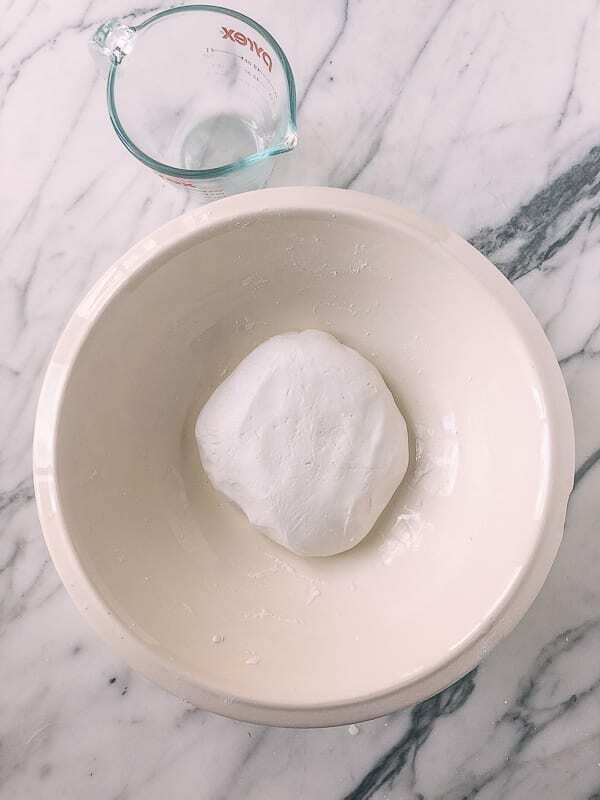 If the dough breaks, you can use a small piece of dough to patch it, using a little dab of glutinous rice flour and water to spackle it back together. Keep a small bowl of both handy for this purpose. Next, gently roll the tang yuan between the palms of your hands to shape it into a uniform round ball. Set your finished tang yuan on a piece of parchment paper that has been lightly dusted with glutinous rice flour. Repeat this process until you have made all of the savory tang yuan. 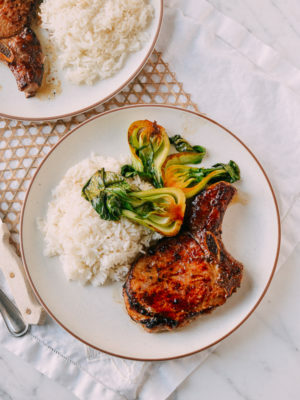 You’ll need another clean, damp kitchen cloth to cover them. Repeat these steps until you’ve assembled all the tang yuan. 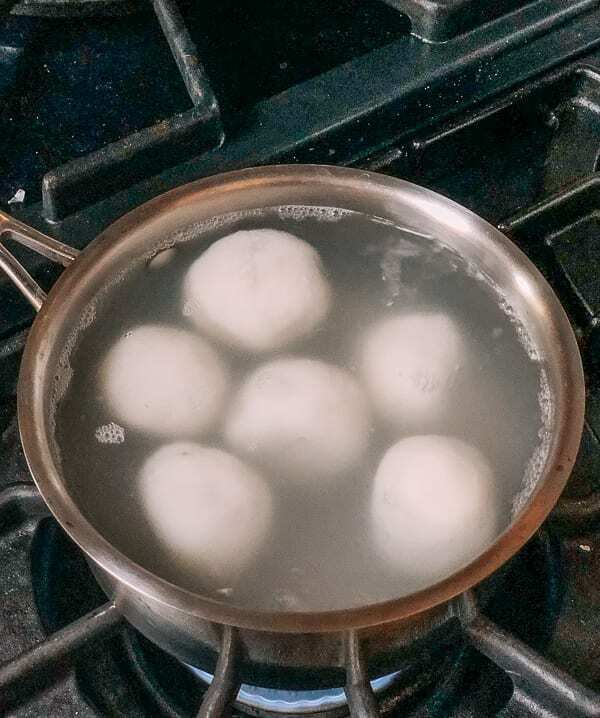 To cook the tang yuan, boil water in a medium pot (you’ll need at least a 4” depth of water). Use a slotted spoon to gently lower the tang yuan into the boiling water, stirring so they don’t have a chance to stick to the pot. 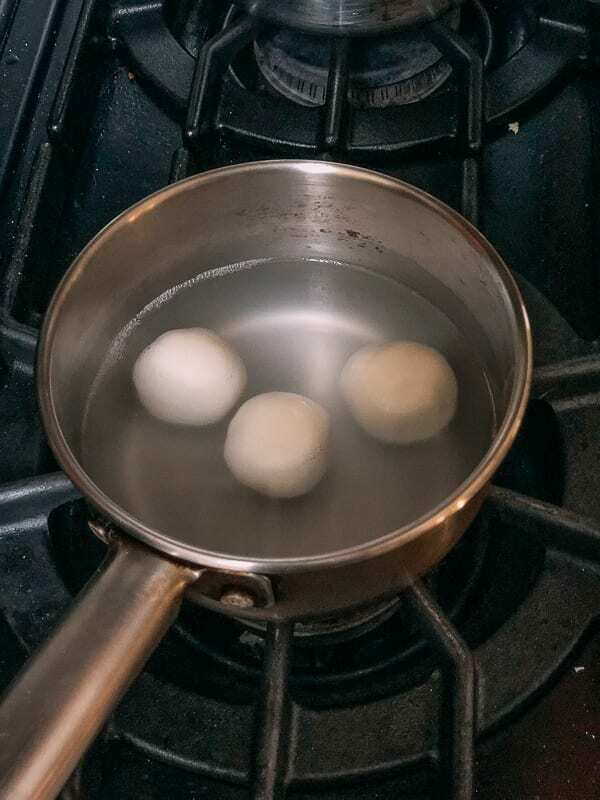 Don’t overfill your pot, as this makes it difficult to cook the tang yuan evenly. Lower the heat to a slow boil. Cook for 6 to 8 minutes or until your Savory Tang Yuan float to the top, stirring periodically. Spoon your savory tang yuan into bowls with some of the cooking water. 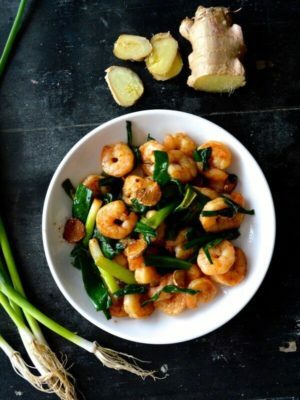 Add seasonings like sesame oil, salt, and scallions and/or cilantro to taste. If you’d like to freeze your tang yuan to enjoy later, simply place all of the assembled tang yuan on a parchment-lined baking sheet so they are not touching. Cover the baking sheet tightly (we use plastic grocery bags for this purpose), and freeze solid. Once the tang yuan are fully frozen, transfer to freezer bags and return to the freezer. We hope you enjoy these Savory Tang Yuan! Wishing you a healthy lunar new year and a happy Lantern Festival! 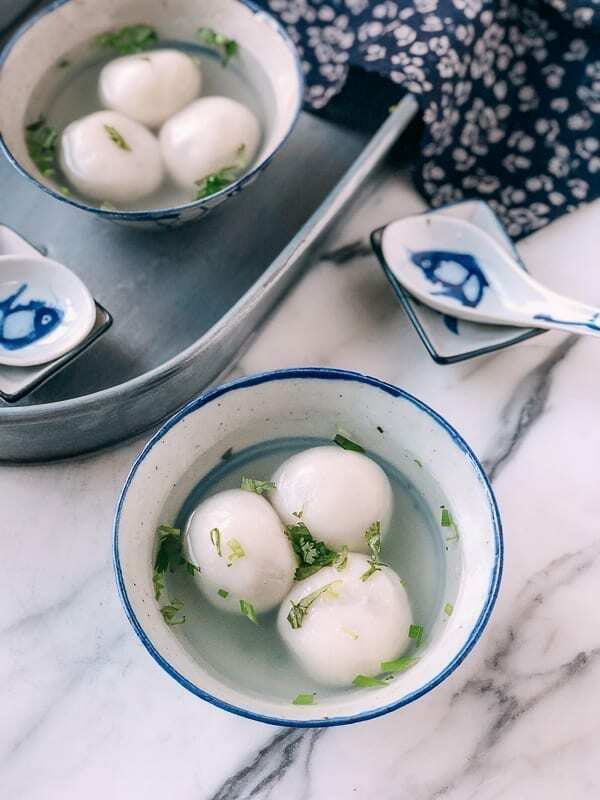 Savory Tang Yuan are sticky rice dumplings filled with pork, salted radish, and mushrooms, perfect for celebrating Chinese New Year & the Lantern Festival. Heat 2 tablespoons vegetable oil in your wok over medium low heat. Add the dried shrimp and cook until fragrant (about a minute). 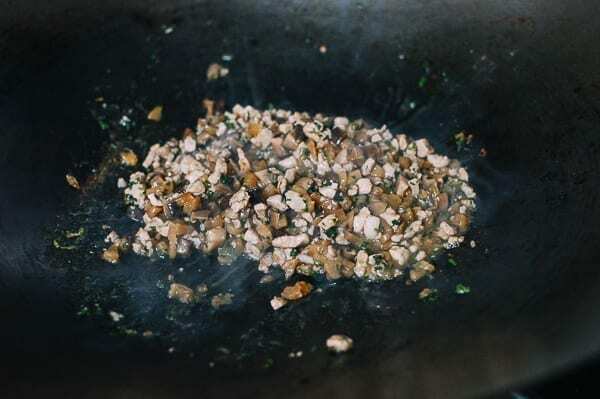 Next, add the ground pork and stir-fry for 30 seconds, or just until the pork is no longer pink. Add the chopped Shiitake mushrooms, salted preserved radish, and Shaoxing wine. 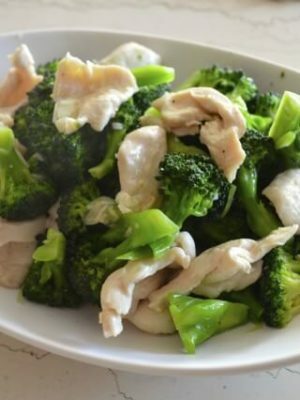 Stir fry for another 30 seconds. 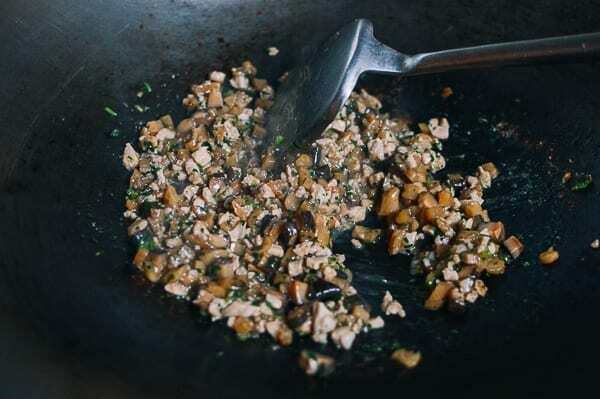 Mix in the sesame oil, salt, sugar, white pepper, oyster sauce, chopped cilantro, chopped scallion and 1 cup of the mushroom soaking liquid. 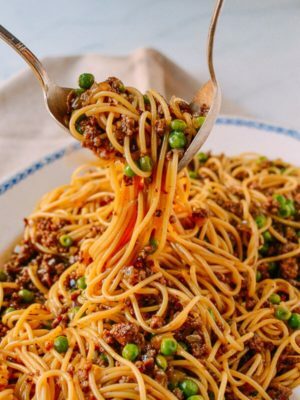 Cook on medium low heat until simmering, stirring often for 2 to 3 minutes, or until about half of the liquid has evaporated. Next, stir in the cornstarch slurry. Cook until the mixture thickens and all standing liquid cooks off. Set aside, cool, and refrigerate for 30 minutes to an hour. While the filling cools, make the dough. 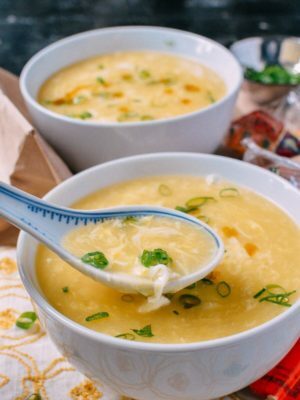 Mix 3½ cups glutinous rice flour and ½ teaspoon salt in a large bowl. 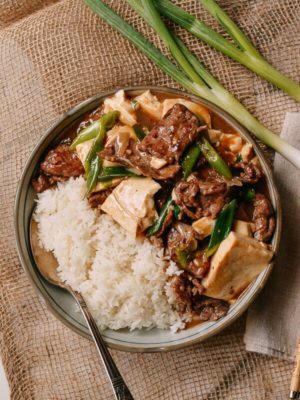 Stir in 1½ cups warm water and mix with chopsticks or a rubber spatula until a dough begins to form. Use your hands to knead until smooth. 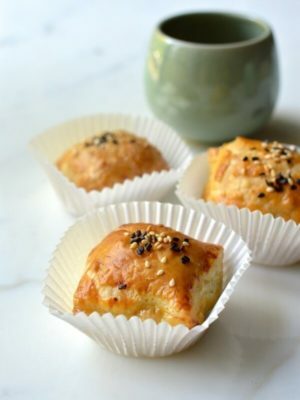 If the dough is too sticky, simply add more glutinous rice flour 1 tablespoon at a time until the dough forms a smooth ball. Next, pinch off three small pieces of dough to form three balls about 1 inch in diameter. 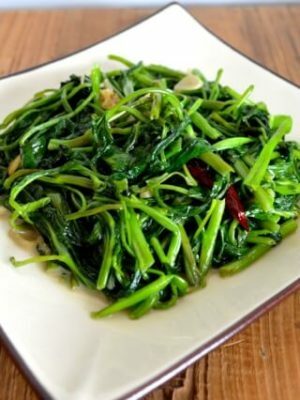 Cook in a small pot of boiling water until they float, about 6 to 7 minutes. Now, add them to the raw dough, kneading them in until the dough is soft and smooth. I have to admit when I did this, I was slightly worried the dough wouldn’t come together, but give it a few minutes of kneading, and it does! 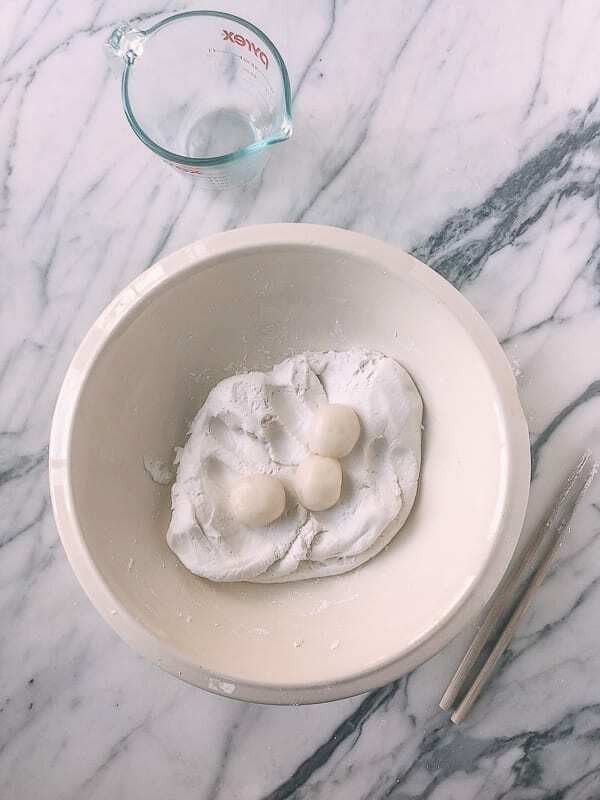 Use your fingers to form each dough ball into a round disc. Spoon about 1 tablespoon (15 g) of filling on the center of the disc. Use the spoon to lightly pack the filling so there are no air pockets. Fold over the edges of the dough to close the tang yuan, lightly pressing in the savory filling if needed. 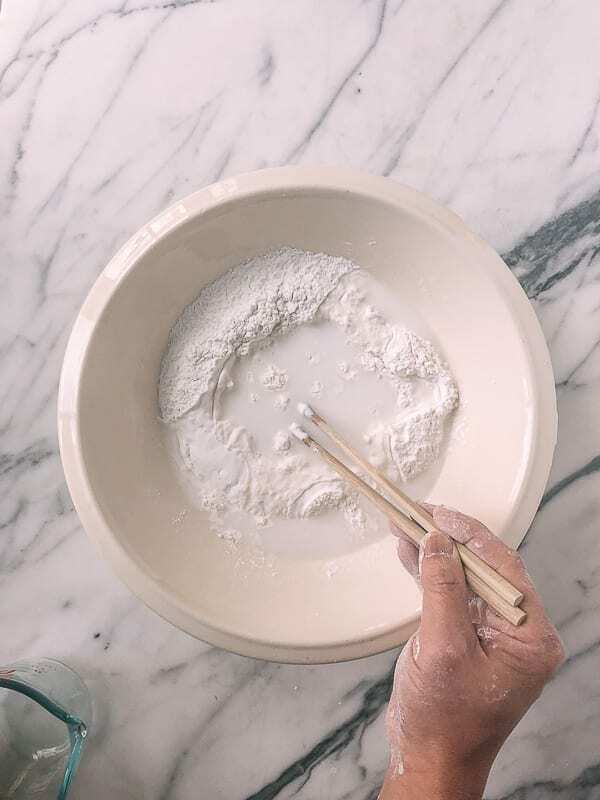 If the dough breaks, you can use a small piece of dough to patch it, using a little dab of glutinous rice flour and water to spackle it back together. Keep a small bowl of both handy for this purpose. Recipe makes 2 dozen tang yuan. To freeze, place all of the assembled tang yuan on a parchment-lined baking sheet so they are not touching. Cover the baking sheet tightly (we use plastic grocery bags for this purpose), and freeze solid. Once the tang yuan are fully frozen, transfer to freezer bags and return to the freezer for use later! I loved making these. 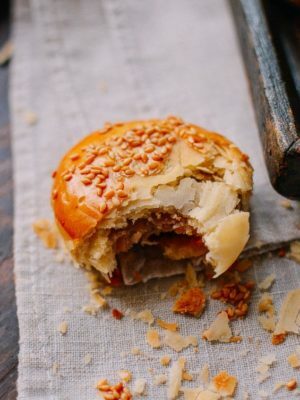 The flavor of the filling was marvelous, and I hadn’t had the smell or taste of the pickled + salted radish since childhood. All this said, my balls were very doughy and sticky! Any suggestions to ensure that the TY balls turn out not so heavy? Hi Abe, all tang yuan are pretty doughy and sticky. 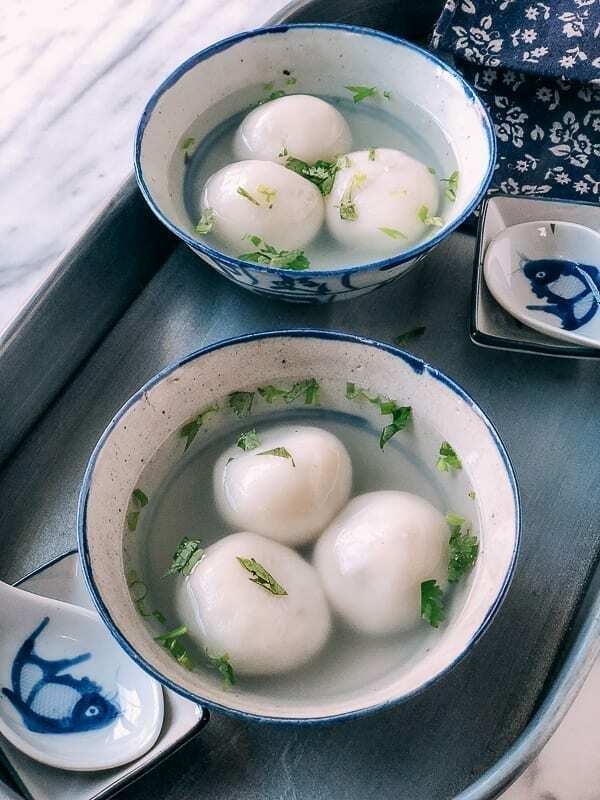 :) However, you can reduce the amount of dough for each tang yuan using the same amount of filling…just keep in mind the skin will be thinner and may break. It is even more important to make sure the filling is chilled thoroughly so it sticks together in a ball, making the tang yuan easier to wrap. I’m really intrigued. 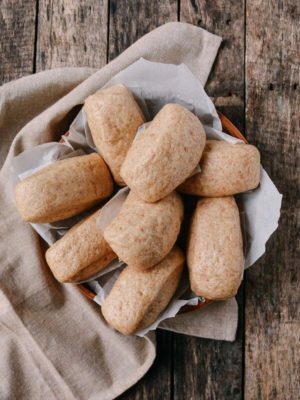 Do you know the reason for adding some of the cooked dough back into the raw dough? Just wondering, because I’ve made sweet tang yuan before without having to do that, and they turned out fine. Hi Cheryl, The cooked dough helps keep the final dough mixture more flexible and soft. It also makes it so it does not crack easily when frozen. Thanks for the note, Bill. I’ll give it a try! How much time should I cook the prepared tang yuan from frozen? Thinking of doubling the recipe for a small gathering. 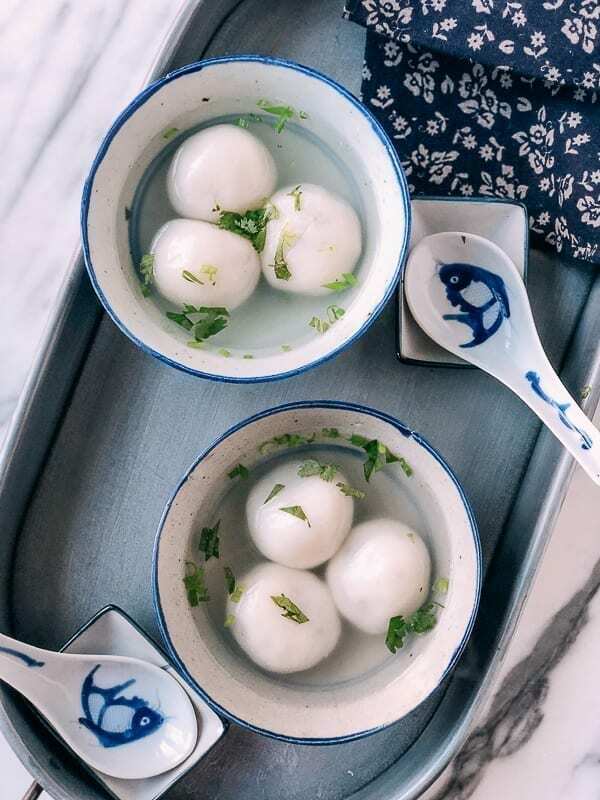 Hi Monica, it should take about 10 minutes when using frozen tang yuan, and they will cook more quickly when using a larger pot and more water. Hope you enjoy these! 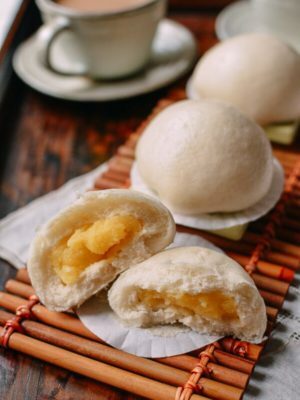 Is the technique the same when making mochi balls for the dessert with tapioca pearls and mango? My mochi balls came out hard like rock. 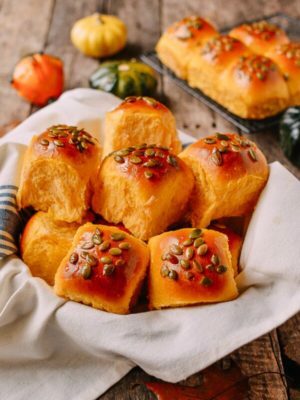 Hi Maricooks, I am not 100% sure, but after this dough is boiled, it is nice and soft! Kung Hey Fat Choy to Bill, Judy, Sarah and Kaitlyn in the year of the Golden Pig. Wishing you good health, prosperity and much happiness in the year ahead. Thank you Roberta and the same wishes to you and your family for the year of the pig! 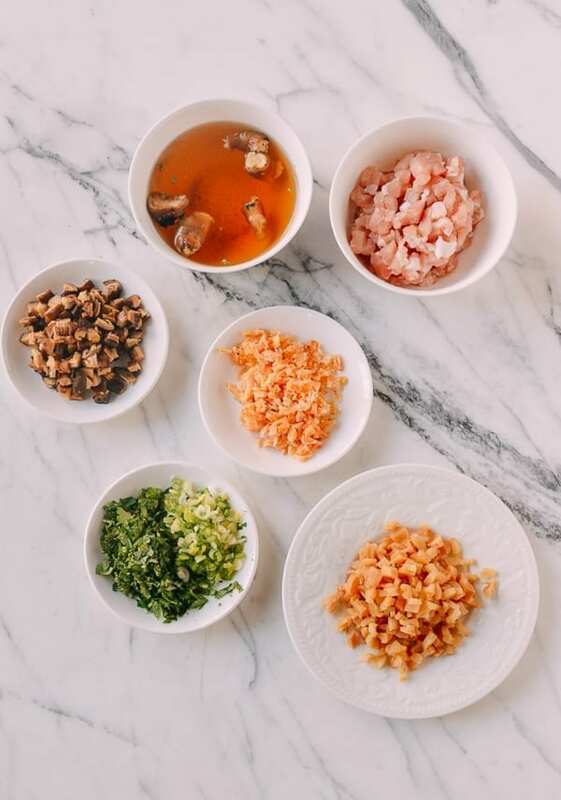 There is also a toisan/taisan savory version where the tang yuan have no fillling and the savory soup consists of the ingredients here along with freshly made shrimp cakes. That’s how we have it. Bill, do you have a recipe for the broth/soup where the tang yuan is not stuffed? Hi A, thanks for the tip! I have never seen tang yuan made in a soup like that! Hi A, I have heard of that but never actually tried it! That’s the version I’m familiar with – except no shrimp cakes.